Marko Kitti is a Finnish-born author who currently lives in Santa Venera, Malta. He has been writing fiction since 2001 and his Finnish publications include two collections of short stories, two novels for adult readers and one novel for young adult readers. In May 2014 Marko released his first children’s book written in the English language. Jesper Jinx is the first of the series of books to feature an eleven-year-old Jesper – a determined action-seeker and probably the unluckiest person in all of Puffington Hill. 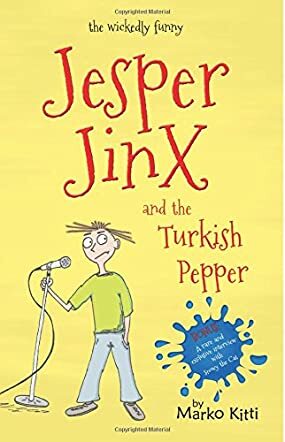 Jesper Jinx and the Turkish Pepper by Marko Kitti is full of wit and whimsical adventures of Jesper Jinx, an average eleven-year-old boy who dislikes cleaning his room, but loves getting into spats with his twelve-year-old sister, and always seems to be bored. His boredom leads him into one adventure after another, as in Jesper Jinx Goes Camping when he decides that he wants to have an overnight camping adventure in his backyard along with his best friend, Oliver. In Jesper Jinx and the Turkish Pepper, Jesper learns what Turkish Pepper really is. If you love fun and learning about new cultures and things, Jesper Jinx and the Turkish Pepper by Marko Kitti is for you. And while you are at it, pick up or order some Turkish Pepper and share it with others so that they can also experience it. I found Jesper Jinx and the Turkish Pepper by Marko Kitti to be an interesting story and ideal for children of all ages. If you watch children closely, their need for adventure takes them to places unknown, especially when they are bored. This story gives children something that they can relate to and be able to daydream about as if they, too, were a part of the story. It is daydreaming and adventure that helps children maintain their creativity. Additionally, the title will make them more curious, causing them to wonder what exactly is Turkish Pepper? Jesper Jinx and the Turkish Pepper offers a great way to: 1) teach others about Finnish culture and 2) introduce its readers to Turkish Pepper. I commend Marko Kitti on doing such a great job of introducing young readers to Finnish culture.